A Little Shout of Joy: Supreme Court Lets Abortion Clinics Reopen, Easing Crisis of Access in Texas | Democracy Now! has been working in abortion care since 1989 and is the founder and CEO of Whole Woman’s Health. Texas abortion clinics shuttered by a recent court ruling have been allowed to reopen after the U.S. Supreme Court blocked part of an anti-choice law that would have required abortion clinics to meet the standards of hospital-style surgery centers. Earlier this month, the Fifth Circuit Court of Appeals allowed the rule to take immediate effect, essentially gutting access to abortion overnight. Thirteen clinics were forced to close, leaving just eight in all of Texas. The latest Supreme Court ruling will allow the clinics to continue providing care while the appeals court considers the law. At least eight have reportedly already opened their doors again. Texas previously had more than 40 clinics, but many remain closed under another of the law’s provisions which requires abortion providers to obtain admitting privileges at a nearby hospital. In its decision Tuesday, the Supreme Court also blocked that requirement as it applies to two clinics in the isolated communities of El Paso and McAllen. We are joined by Amy Hagstrom Miller, CEO of Whole Woman’s Health in McAllen, the only abortion clinic open south of San Antonio. It will begin seeing patients again on Friday. NERMEEN SHAIKH: We turn now to Texas, where abortion clinics shuttered by a court ruling earlier this month have been allowed to reopen. This comes after the Supreme Court blocked part of an anti-choice law Tuesday that would have required abortion clinics to meet the standards of hospital-style surgery centers. It was just two weeks ago that the Fifth Circuit Court of Appeals had allowed the rule to go into effect immediately, essentially gutting access to abortion overnight. Thirteen clinics were forced to close, leaving just eight in all of Texas, all of them clustered in four metropolitan areas. The latest move by the Supreme Court will allow the clinics to continue providing care while the appeals court considers the law. At least eight have reportedly already reopened. AMY GOODMAN: But many Texas clinics still remain closed under another of the law’s provisions, which requires abortion providers to obtain admitting privileges at a nearby hospital. In its decision Tuesday, the Supreme Court blocked that requirement, as it applies to two clinics in the isolated communities of El Paso in West Texas and McAllen in the Rio Grande Valley. That will allow Whole Woman’s Health in McAllen to begin providing abortions again after it had closed earlier this month due to the appeals court ruling. It’s the only abortion clinic currently open in the Rio Grande Valley. In fact, it’s the only one south of San Antonio. For more, Whole Woman’s Health CEO and founder Amy Hagstrom Miller joins us now, actually, from Charlottesville, Virginia. Her clinic in McAllen, Texas, will start seeing patients again tomorrow. Welcome to Democracy Now!, Amy. It’s good to have you back on. Explain what’s happened. Your clinic’s open—that’s when we spoke to you—then it’s closed, then it’s reopened. AMY HAGSTROM MILLER: We’ve had quite a—really, 18 months of what oftentimes feels like whiplash, where we’ve been open, closed, open, closed. And it’s really been a challenge not only for the women in the community to kind of know what they can count on and where they can go to get services, but it’s been challenging for my staff to really have such an unstable kind of environment in which to answer, you know, the questions from women in the community about where they can go and what care they can get. So, we were open in McAllen, and then we closed in March, and then we were able to reopen once we got that injunction. But it was just for a month. And now we’re reopened again. We’re starting to schedule patients again tomorrow. And so, we’re hopeful that this injunction will protect us and the court will recognize the undue burden that women in the valley are facing. NERMEEN SHAIKH: And, Amy, could you also talk about your response to the Supreme Court decision when you initially heard? AMY HAGSTROM MILLER: Yeah, it was, you know, one of the first times, I think, in the last 18 months that I really kind of let out a little shout of joy. It was surprising, mainly surprising because both Kennedy and Roberts ruled in our favor. And I think, in our case, we really clearly demonstrated that this law has nothing to do with, you know, anything medical based on medical facts, that there’s politics involved here, and that the admitting privileges and the ambulatory surgical center requirements simply combined together to really close clinics down, and that access to safe, compassionate abortion care improves the lives and the health of women all over the state. And so, I’m encouraged that we’ve gotten this injunction from the Supreme Court, and I’m encouraged that it will protect us for a while so we can be available to the women in the state. AMY GOODMAN: In a memo to the Supreme Court defending the anti-choice law, the Texas attorney general, Greg Abbott, who’s running for governor, and his colleagues wrote, quote, “It is undisputed that the vast majority of Texas residents (more than 83%) still live within comfortable driving distance (150 miles) of an HB2-compliant abortion provider,” unquote. 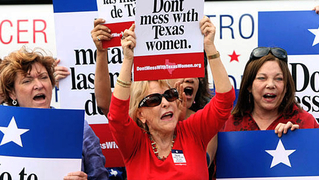 For those in more remote areas, Abbott wrote, “abortion can be accessed by driving approximately 230-250 miles—an inconvenience, but still a manageable one.” Again, Abbott is running for governor against Texas State Senator Wendy Davis, who opposed the anti-choice bill in an 11-hour filibuster last summer. Amy Hagstrom Miller, your response? AMY HAGSTROM MILLER: You know, I think there’s over one million women of reproductive age who live more than 250 miles from a clinic. Texas is a very large state both by population and by geography. And so, for him to sort of swipe those women under the rug as though they don’t matter is really telling to how he’s going to approach the governing of women in rural areas in the community, women who are left behind without healthcare coverage, and women who really need our advocacy the most. AMY GOODMAN: Amy Hagstrom Miller, we want to thank you for being with us, joining us from the University of Virginia, Charlottesville. She’s been working in abortion care since '89. She's the founder and CEO of Whole Woman’s Health.